How do you make a romantic photo even more romantic? Add fireworks, of course. In case already-released photos of Meghan (née Markle), Duchess of Sussex, and her husband, Prince Harry, Duke of Sussex, aren’t cute enough, the couple decided to put a never-before-seen shot from their May wedding reception on their first Christmas card as a married couple. The Kensington Palace social media team shared it on Twitter on Friday, and we have to say it’s pretty perfect. The black-and-white photo shows Meghan and Harry, still in their formal wear, watching a fireworks display over Frogmore House (their new home, come spring) with their arms around each other. 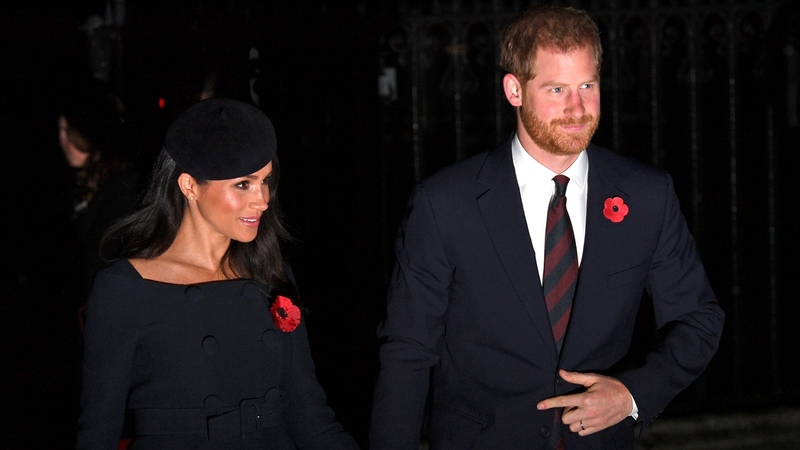 Photographer Chris Allerton even managed to catch the pair holding hands at Harry’s back. Although Meghan and Harry don’t have their own social media accounts — none of the British royals do, with the exception of Princess Eugenie — the pair are currently featured on all the Kensington Palace accounts, alongside Prince William, Duke of Cambridge, and Catherine, Duchess of Cambridge (more commonly known as Kate Middleton). When their court splits in a few months, it’s unclear how social media will be handled. In any case, both Meghan and Harry have had their own photographs shared on the official royal accounts, including a maternity shot of Meghan that Harry snapped in November and a photo of Prince Harry on stage at the Invictus Games closing ceremonies in October, taken by Meghan. The pair also weren’t the only ones to release their Christmas card photo on Friday. Kensington Palace also shared a photo of Prince William and Catherine, along with their kids, Prince George, Princess Charlotte and Prince Louis. Next year, Meghan and Harry will have their own bundle of joy to feature on their holiday cards, and honestly, we can’t wait. These two have been way too adorable when it comes to talking about their first child, who’s due sometime in the spring.